The Fiat Money system is a currency system that is supported by nothing but a countries promise or law. Every dollar you hold in your hand or bank account, represents a dollar of US debt backed by nothing but the countries promise to pay back the debt. The big question is with what will they pay back the debt? More dollars backed by more debt? As you see in the chart above, the world GDP stars to increase with the creation of industry, world trade and other innovations. However, as the world started to adopt a fiat money system the GDP really took off. All other increases in wold GDP pale in comparison to the advances made since the implementation of a world wide fiat currency system. What is a Bubble? A price level that is much higher than warranted by actual fundamentals. 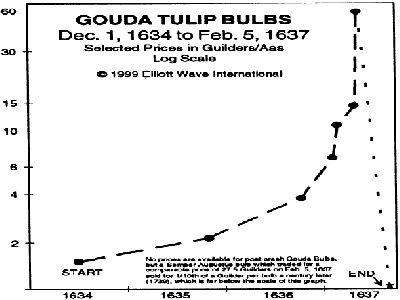 A good example a classic bubble is the tulip bubble featured in the chart above. Federal Spending Bubble: $1 of ever $4 spent in the U.S. economy is direct spending by the Gov't. Debt Bubble: $1 of every $3 spent by the Gov't is a borrowed dollar. I believe we are in a Fiat Bubble. Our economy is artificial. We hardly export anything anymore, but we are not the only ones. The Fiat system has taken hold in many advanced economies. Our Fiat spending has also helped fuel growth in emerging markets. It cannot continue. This has happened over the last 40-50 years and will take a few years to top out before it crashes. Bubbles always last longer than you think and crash faster than you can imagine. But when the bubble does finally pop, it will happen fast, and we will experience recession and depression like never before. I promise one thing, The Fed will do everything in their power to keep this system going. The crash will likely be triggered by high inflation caused by desperate attempts of the Fed to "save" us.